Last week saw the curtain call of the Olympic cycle for four years, and the Paralympic Games came to an end amidst a spectacular closing ceremony. It brought to an end the biggest Paralympic Games to date – in terms of atheltes, support staff, media coverage, and financial incentives (both direct and indirect for athletes), and it was a fitting end to a spectacle of sport in Beijing over the last 6 weeks. The Paralympics are themselves a fitting way to end the Olympic cycle – I dare say that the original Olympic ideals are embodied MORE in the Paralympic Games than they are in the Olympic Games, with the triumph of the human spirit evident in every one of the participants of the Games. That will possibly incur the ‘wrath’ of those who are intimately involved in the Olympics, and I certainly don’t wish to discredit either Games – just look at our comprehensive Olympic coverage and you’ll see that the Olympic Games are THE pinnacle of the world of sport. But the Paralympics brings something else, an angle that can’t be matched by the Olympics, though for different reasons. That’s a very difficult question to answer, and sometimes, the problem is that if you ask a difficult question, you won’t like the answer you get. You should not, in fact, be asking the question…And this is the case here, particularly when the media choose to sensationalize this by taking it completely out of context. This happened to me last week, unfortunately, when a daily tabloid (Die Burger) took some quotes completely out of context and I was vilified for “criticizing” the Paralympic Team. Much of the last week has been damage limitation thanks to that article. However, the one good thing that came of it is that it got me thinking about what we can learn from the difference in performance between our SA Olympic team and the SA Paralympic team, and just how one might compare the two Games, if at all. First of all, one has to objectively analyse performance, otherwise it’s emotive, subjective guesswork. South Africa finished 71st on the medal table in the Olympcis, and 6th in the Paralympic medal table. But what of the other nations? It’s helpful to figure out whether this change is common or completely unusual. 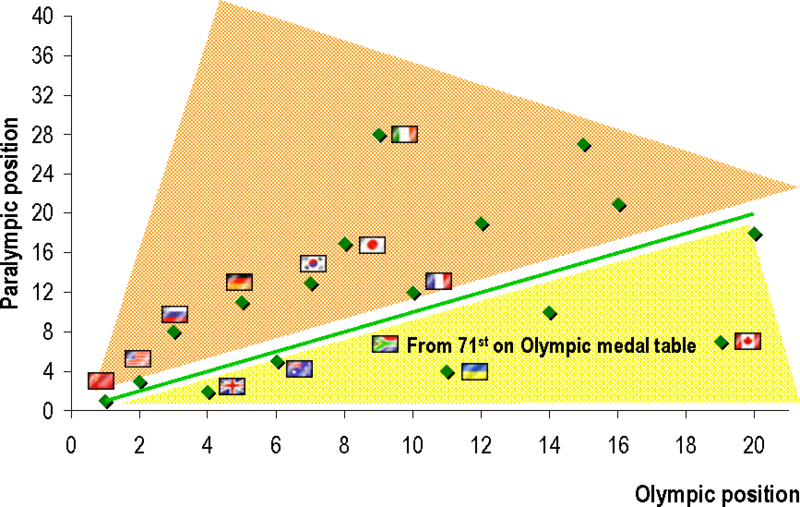 So the graph below shows the finishing position of nations on the Paralympic medal table plotted against the finishing position in the Olympic Games. I’ve had to change the scale of the axes to fit it all in, but you can see that the correlation is fairly tight – in other words, nations who do well in the Olympics tend to do well in the Paralympic Games. China won both, the USA were second and third respectively. Great Britain were top 5, Australia top 6 in both. The outliers to this correlation are the “poorer” nations, where disabled athletes are not prioritized – that was China until very recently, I might add. In 1996, they finished only ninth. Twelve years later, they won double the number of medals of the second best country, thanks to a focused effort on the Paralympic Games! However, there are still nations, like Ethiopia and Jamaica who are missing from this comparison – that’s a function of ACCESS, which I’ll get to shortly. The green line represents where the nation would lie if it finished in EXACTLY the same position in both Games. If the country is in the yellow shaded area, then their Paralympic performances are superior, whereas if they are in the orange, their Paralympic performances are inferior to the Olympic performances. So the Ukraine are strong at the Paralympics – they finished 11th on the Olympic table, and 5th in the Paralympics. In contrast, Italy had a good Olympic showing – 9th, but only finished 28th in the Paralympics. However, the “winner” for big improvers is South Africa – 71st to 6th, which is an enormous difference. So therefore, the SA Paralympic Team is deserving of all the praise it can get. We should be celebrating, it is an astonishing performance when viewed this way. Why the difference? What can we learn from the success of the Paralympians? Or is that the failure of the Olympians? Now here’s where it gets tricky. People in SA have asked this question with the intention of trying to label the Olympic Team as failures, and because they want to prove that the “Sporting System” for Paralympic sports is so much better. Both are grossly unfair, because, and I’ll be as direct as possible here…you cannot compare performances BETWEEN the two Games – the comparison between Olympic Games and Paralympic Games is completely erroneous. Why? Because they are such completely different “phases” of their lifecycles as events. Sport undergoes a certain evolutionary process, which sees the number of competitors, the depth of competition, and therefore the intensity of competition change over its life. Formation is the starting point, where the event or sport begins. In the case of the Olympic Games, I guess we could argue the semantics, but I think it’s safe to say that it began in 1896, although in 2008, we could also say we saw the formation of 10km swimming, BMX cycling, and women’s steeplechase events, for example. 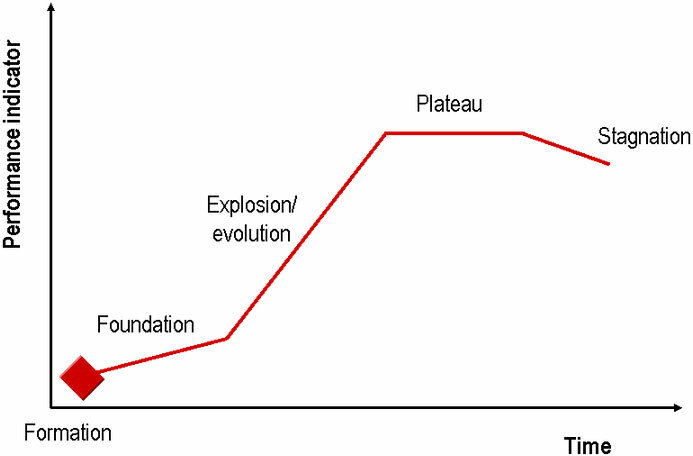 The next phases might be described as Foundation, Explosion, Plateau and Stagnation. Foundation is really where the “pioneers” come along and chart the previously unchartered waters. We see this is sport all the time – there is a period of improvement which can be rapid or gradual depending on the sport, but the point is that this is almost always followed by an “Explosion” in performance. Suddenly (for a number of reasons) the sport becomes popular, and more and more athletes turn to it. It gets more professional, training improves, financial incentives increase, and performances explode. Eventually, it reaches a plateau, where improvements are much smaller and infrequent. Finally, there is stagnation, where the sport loses impetus or requires modification to keep interest levels up. This is a general illustration, of course, and you’ll be able to pick ‘outliers’ to this trend – swimming, for example, has recently undergone another explosion, thank to technology of swimsuits, pools and training methods. But I’m sure you can think of other examples that fit – women’s pole vault is a good one. It’s in an “explosion” phase right now, thanks to Yelena Isinbayeva who followed on from the foundation phase’s “pioneers”. Eventually, others will bridge the gap, and the event will hit a plateau. The marathon goes a similar way. However, the key point is that the Paralympics are in a completely different phase – I believe they are still in the explosion phase, where performances are improving rapidly. The Olympics, on the other hand, are in the plateau phase, where the sport has reached a level of performance that makes it difficult to find further rapid improvements. A lot of this has to do with access and maturity of the sport. This life-cycle model partly explains why the margins of victory in the Paralympcs are so much larger than in the Olympic Games. In 200m swimming events, for example, the winning margin in the Olympic Games was just under 2 seconds. In the Paralympic Games, it was over 6 seconds. There were two 200m races that stand out – one was won by 11 seconds, another by 12 seconds. Natalie du Toit, the athlete of the Games, won a 400m race by 25 seconds! That is clearly not “normal” when compared against the Olympic Games, but in the Paralympics, it happens because we’re still in that Explosion phase, where it is perfectly normal. What will happen over the next 20 years is that more and more athletes will bridge that gap, and by 2028, we’ll see a very similar standard of competition between Games. The other excellent example of this is the emergence of the Kenyan men. Beijing was really the first time that a GROUP of Kenyan men dominated middle and long distance events (by dominated, we’re talking five gold medals. We’re accustomed to seeing this at the Olympics, but for the Paralympics, it is a major step forward, because it shows that ACCESS to the Games is increasing. The fact that those Kenyan men broke world records by in excess of 20 seconds (in a 5000m event) is yet another indication that that Paralympic Games are in the “Explosion/Evolution” phase – such margins do not (or should not) happen in mature competition. The next step is that these “pioneer” Kenyan men will be succeeded by even better Kenyan athletes, and the records will fall even faster. Then the Ethiopians and Ugandans will emerge, and pretty soon, perhaps two generations from now, the Paralympic distance events will be in their “Plateau” phase as well – natural progression raises standards. So what will happen in future, as the Paralympic Games matures, is that ACCESS will increase. More nations will send more athletes, and as a result, the “gene pool” of the Paralympics will begin to resemble that of the Olympics. This will drive even more of an evolution in performances, and it will also increase the depth of competition enormously. We can therefore expect, as a normal course of events, to see that by 2012, there are already closer races and improved performances. By 2028, I suspect that the level of competition will be very similar, and you will also have a very similar demographic of competiting nations – remember, there was not a single athlete from the Caribbean in the men’s 100m finals in the Paralympics. They dominated the Olympic Games. Therefore, with specific reference to the South African situation, you cannot compare the 30 medals won by the Paralympic team with the single medal won by the Olympic team, because those medals are won in a completely different context, against different backdrops of competition and with different criteria for evaluation. Both medals are equally worthy, but when you start making the comparison between the two, then you paint yourself into a corner, because the reality is that Paralympic competition lacks the depth of the Olympics right now. That’s not a bad thing, it’s just a natural consequence of maturity, access and development issues. There are, of course, numerous other issues at play here – the classification system of the Paralympics is fraught with difficulty. It’s an almost impossible task to classify the different levels of disability without compromising the “integrity” of competition somehow. Sport, at its very core, has “equality of competition” as its most valuable characteristic. We know this is never true, of course, but it’s implicit on the starting line. The Paralympics has to manage the fact that this is never the case, and it does pose challenges. Then there is the size of the competition – 4000 athletes represents a large percentage relative to the Olympic Games. 10,000 athletes (out of 6 billion) make the Olympic Games, and only 300 win Gold medals. In contrast, 4000 competed at the Paralympics (out of perhaps 100 million – a much higher percentage), and 473 Gold medals are awarded. Purely by numbers, there is a difference. The future – professionalization around the corner. Are we ready? Then finally, it would be careless not to point out that success today does not guarantee success tomorrow. That is particularly true in this case, because of the growth of the Paralympics – more nations are competing and more are focusing on Paralympic sport and that means that progress is going to be rapid. China’s 2008 investment will spur on other countries, and the demand for these Paralympic golds will rise. This is driven by the increasing media attention on the Paralympics, which means more money to the Games, and more money means a more professional approach, as the standard of competition rises. So the point is: Let’s not compare the Games. There are lessons to be learned about why the SA Paralympic Team did so well, but I won’t go into those here, because most of you reading this are not in South Africa. Those lessons should be learned (they won’t be, given SA’s history, but anyway…), but dealing with the SA Olympic problems is a completely separate problem. It’s not about the systems and the attitude of athletes and the “will to win” – it’s about celebrating Paralympic success on its merits, and we need to focus on celebrating the performances of our Paralympic athletes, who are worthy of that recognition. And then let’s deal with the Olympic problems separately. This post is part of the following threads: News/Controversies, Olympics Games – ongoing stories on this site. View the thread timelines for more context on this post.